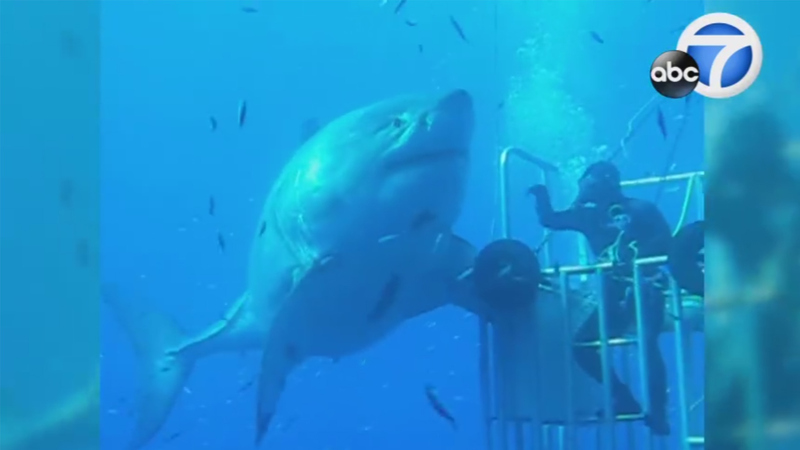 GUADALUPE ISLAND, Mexico -- She's the world's largest shark, dubbed Deep Blue, and she was captured on video off the coast of Mexico. New video has surfaced of Deep Blue, which is as big as a metro bus, and it's giving scientist a better perspective at the giant that shocked the world when her existence was first revealed. Michael Maier was the man behind the camera and he released more video from the aquatic encounter that captivated the world. Maier and his fellow divers were submerged off Guadalupe Island, which is located about 300 miles southwest of San Diego. The divers were dangling large chunks of meat when the leviathan slowly emerged from the depths. Deep Blue appeared and she made a move at one of the divers, but the diver quickly ducked into the safety of the cage. The great white shark took the bait and did a few laps around the diving cage. At one point a diver gave her a high five as she glided by. Shark experts believe Deep Blue is about 50 years old and was possibly pregnant and about to give birth when the encounter took place. Experts said it's possible that she has given birth to more than 100 babies in her lifetime. There is no tracking device on Deep Blue, so it's not known where she currently is located.